There are many women in and around Lincoln in leadership positions because Alice Dittman helped forge the way years ago. She was not only the first woman president of a bank in both Lincoln and Omaha, but she was the first woman chair of the Lincoln Chamber of Commerce, of the Bryan Hospital Board, of the Nebraska Chamber of Commerce, and the Nebraska Bankers Association. And, the list goes on. 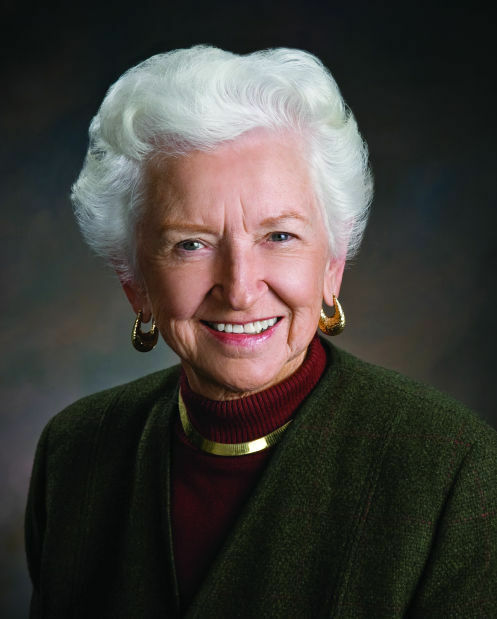 Alice became President and CEO of Cornhusker Bank in 1975 after her husband Mark passed away. When she took the reigns of the bank it was valued at $8 million. During her tenure the bank grew to more than $200 million. Today the bank is led by one of her sons, John. In this interview, you’ll hear her talk about her three children, Dawn, John and Doug. After her husband died, she not only raised the children as a single mother, but she also served as President and CEO of the bank. You’ll get a chuckle out of one of her stories about hurriedly cooking dinner for the children so she could make it to a dinner meeting herself. Alice may have retired from Cornhusker Bank, but in a variety of ways she’s remained deeply involved in Lincoln and even across Nebraska. 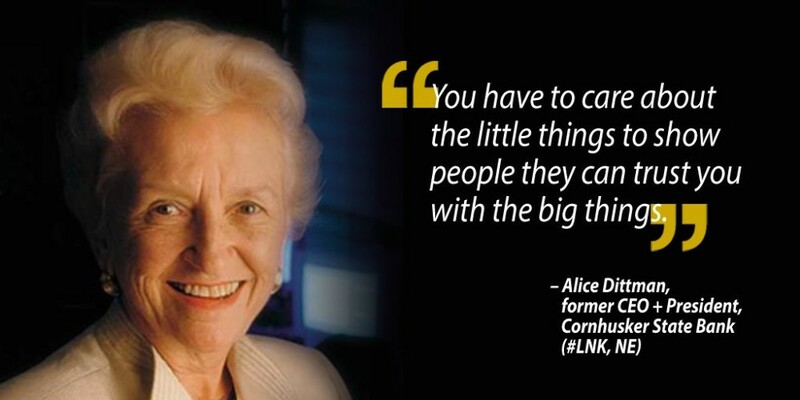 One way she continues to show leadership is the Alice Dittman Integrity Fund. Cornhusker Bank has set aside $1 million for loans that don’t call for collateral. I’m proud of being the chief volunteer for the Bank. She’s proud of her education, too. In 1952 she was awarded a BS degree from the University of Nebraska-Lincoln and a Master of Arts Finance/Management from UNL in 1955. Along the way she also participated in educational programs at Harvard/Ratcliff and the University of Wisconsin. We’ve only scratched the surface of what you’ll hear in this interview. We know you’ll enjoy getting to know Alice Dittman as you hear her talk about everything from the importance of the date of her birth to comments about the Integrity Fund at Cornhusker Bank. She’s led the way helping women in and around Lincoln move into leadership positions. Lincoln has a heritage of family commitment to Lincoln. There are many families that have done so much for Lincoln through many generations. Our bank has collected about 160,000 pairs of shoes through our program “A Day Without Shoes.” People donate the shoes through a number of organizations across the community, high school students help sort and prepare the shoes to be donated. It’s a great thing that we’re proud of. The people of Lincoln care for one another. A few years ago I counted the number of pages in the phone book Yellow Pages that included organizations providing help. There were 22 pages, that shows that the people of Lincoln care. 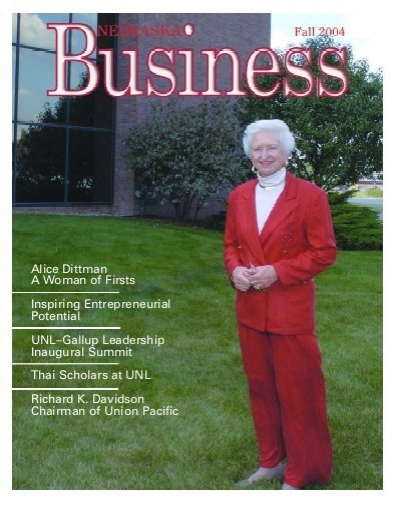 We encourage you to read this interesting article about Alice, published in the University of Nebraska-Lincoln College of Business alumni magazine.